Police Chief Jack Lumpkin addressing the press concerning recent shootings. 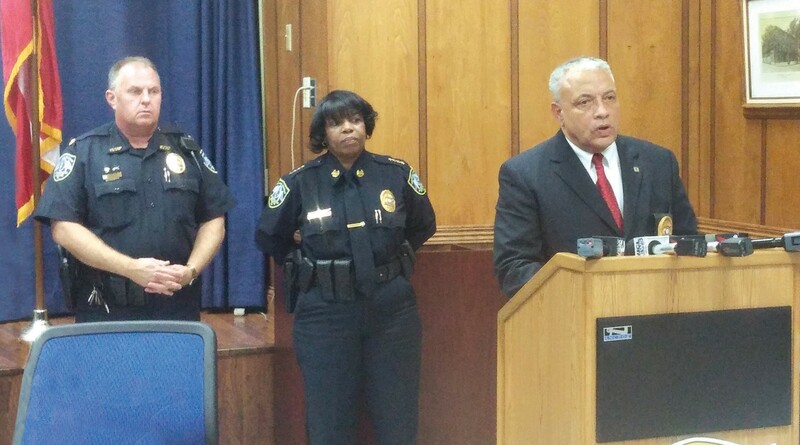 On Monday, November 17, Savannah Chatham County’s newest Police Chief Jack Lumpkin held a press conference to encourage the community to provide any information about the shootings that occurred over the past weekend. “If you saw something, as a citizen, please let us know”. said Lumpkin. A total of nine shootings took place in Savannah and the Savannah Chatham-County Police are still investigating. The first of the seven shootings happened at West Bay and Carolan Streets around 8 p.m. Friday night. The victim was identified as 30-year-old Edwin Burroughs. Another shooting happened hours later at 4 a.m. Saturday. This shooting took place in the Hudson Hill neighborhood. Police are investigating this shooting as a homicide. Miles away from the Hudson Hill shooting, two more shootings took place at around 4 p.m. One took place in the 1500 block of Maryland Avenue and the other on the 100 block of Brandon Lane. Both victims were transported to Memorial University Medical Center. Hours later on Saturday, another shooting happened on Lucus Drive where a man was shot in the arm. The latest of these shootings happened on Sunday, November 16. One shooting was reported at Westlake Apts. on Westlake Ave. Investigators say the shooting happened around 6:45 p.m. The victim was identified as 25-year-old Willie Lee Bostic. Another shooting occurred in the area of 34th and Bull Streets at around 9:30 p.m.
Chief Lumpkin said that the victims are not cooperating and coming forth with what was seen which is making it hard for police to solve the cases quickly as possible. A case of a 14 year old firing into a floor and accidentally shooting a cousin could have been solved much quicker if cooperation was done. All of these shootings remain under investigation.